Mapped using DEP Wetlands data: coastal beach, rocky Intertidal shore and barrier beach–coastal beach. Beaches and dunes are coastal habitats that extend from high dunes to the mean low tide mark, with sediment ranging from fine sand to gravel and cobble. They are dynamic habitats that endure constant exchanges between the ocean and land 2, receiving pulses of organic matter and sediment that originate from various inland and offshore habitats 3. Beach and dune structure can vary widely depending on the inherent geology (reflected in the sediment size, shape, color, and texture) and orientation 6; formation occurs as a result of large-scale processes such as wind, tides, wave action, currents, and glacial history 4,11. Beaches and dune habitats perform many ecosystem services including nutrient recycling, water filtration, and providing a boundary of exchange between multiple coastal ecosystem types 4. 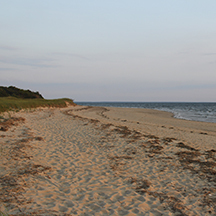 Beaches are popular locations for recreational activities and shoreline residential development, and are a foundation for many seasonal coastal economies. They are also critical for protecting inland estuarine habitats, people, and infrastructure from sea level rise and storms 1,10,11. Massachusetts has identified 48 Species of Greater Conservation Need (SGCN) that occupy beach and dune habitats,5 including a suite of coastal sea and shorebirds, marine mammals, invertebrates, and plant species. Piping plover, least tern, peregrine falcons, whip-poor-will, red knots, common night hawks, egrets, herons, as well as other migratory birds utilize beaches and dunes seasonally for nesting and foraging 5,9. Invertebrates such as the northeastern beach tiger beetles, ghost crabs, and horseshoe crabs, as well as diamond-backed terrapins use beaches and dunes for critical aspects of their life history. Grey seals are a key marine mammal on Massachusetts’ beaches, especially off of Manomot National Wildlife Refuge. Other more common mammals such as foxes, raccoons, and domestic animals often use beaches but are considered a threat to wildlife through predation. Although beaches are typically devoid of vegetation, a number of plant species occur on dunes, such as seabeach needle-grass, broom crowberry, and seabeach knotweed 8. Beaches and dunes are threatened by human activities including residential and commercial development, transportation corridors such as roads and other hard structures, and pollution including trash and oil spills, as well as unintentional damage from tourism, recreation, and motorized vehicles. Climate change is expected to directly impact beaches and dunes. Sea level rise will reduce the width of many beaches and dunes and alter sediment transport patterns 7,8. Barrier beaches have the ability to migrate inland and upslope as sea levels rise to a point where sediment is plentiful and no physical barriers exist 11. Such migration may be facilitated by climate-smart management actions. A study conducted in Rhode Island found that development began to block the inland migration of beach habitat with a sea level rise of 1.6 feet 12. Many plant species that occupy beaches and dunes are at the southern extent of their ranges; projections of warmer temperatures suggest that some species may shift their distributions north to follow optimal conditions 5. This in turn could lead to increased destabilization of dune sediments and impact habitats where plant species are no longer abundant. Destabilized dunes also have an impact on effective storm protection to inland areas. Projections of rising sea levels in combination with more coastal storm events and a limited sediment supply are expected to increase damages due to increased storm surges and higher tides, thus increasing the hazard of erosion to beaches and dunes. There are strong concerns that native coastal wildlife may not be able to keep pace with these coastal stressors, potentially resulting in alteration or loss of important coastal habitats 1. Human alterations to the shoreline system, including inappropriate shoreline stabilization methods (e.g., shoreline hardening, jetties, and groins), can actually do more harm than good by exacerbating beach erosion, damaging neighboring properties, impacting marine habitats, and diminishing the capacity of beaches and dunes to protect inland areas from storm damage and flooding. Beach and dune nourishment is one adaptation strategy to enhance or restore capacity of beaches and dunes to protect inland areas from storm damage and flooding and maintain habitat and ecosystem function for coastal species. However, the effects of beach nourishment on shorebirds and other beach-dependent species are mixed and depend on factors such as the compatibility of new material with the native beach sediments and changes in beach morphology 13,14. For example, nourished beaches can increase the likelihood of scarping (high, steep sloping areas of dunes caused by erosion) and compaction of sediments, particularly short term, which can create unsuitable excavation and incubation conditions for nesting fish and wildlife 15. The timing and size of nourishment projects are also important for minimizing ecological impacts. Winter is generally optimal for avoiding adverse impacts to nesting birds, and a greater number of smaller projects may be less impactful than a single large nourishment project 14. 1. Arkema, K.K., G. Guannel, G. Verutes, S.A. Wood, A. Guerry, M. Ruckelshaus, P. Kareiva, M. Lacayo, and J.M. Silver. 2013. Coastal habitats shield people and property from sea-level rise and storms. Nature climate change 3:913-918. 2. Falco, G.D., F. Budillon, A. Conforti, S.D. Muro, G.D. Martino, S. Innangi, A. Perilli, R. Tonielli, and S. Simeone. 2014. Sandy beaches characterization and management of coastal erosion on western Sardinia island (Mediterranean Sea). Journal of Coastal Research, Special Issue 70:395-400. 3. Feagin, R., D.J. Sherman, and W.E. Grant. 2005. Coastal erosion, global sea-level rise, and the loss of sand dune plant habitats. Frontiers in Ecology and the Environment 3:359-364. 4. Gares, P.A. 1992. Topographic changes associated with coastal dune blowouts at island beach state park, New Jersey. Earth Surf. Process. Landforms 17: 589–604. 5. [MA SWAP] Massachusetts Division of Fisheries and Wildlife. 2015. Massachusetts State Wildlife Action Plan 2015. Westborough, MA. 6. Matias, A., A. Vila-Concejo, O. Ferreira, B. Morris, and J.A. Dias. 2009. Sediment Dynamics of Barriers with Frequent Overwash. Journal of Coastal Research 25:768-780. 7. Moser, S. C., M. A. Davidson, P. Kirshen, P. Mulvaney, J. F. Murley, J. E. Neumann, L. Petes, and D. Reed, 2014: Ch. 25: Coastal Zone Development and Ecosystems. Climate Change Impacts in the United States: The Third National Climate Assessment, J. M. Melillo, Terese (T.C.) Richmond, and G. W. Yohe, Eds., U.S. Global Change Research Program, 579-618. 9. Niles et al. 2009. Effects of Horseshoe Crab Harvest in Delaware Bay on Red Knots: Are Harvest Restrictions Working? Bioscience 59:153-164. 10. Schlacher, T.A., J. Dugan, D.S. Schoeman, M. Lastra, A. Jones, F. Scapini, A. McLachlan, O. Defeo. 2007. Sandy beaches on the brink. Diversity and Distributions 13:556-560. 11. [WHSG] Woods Hole Sea Grant. 2015. The Effect of Sea Level Rise on the Barrier Beaches of Cape Cod, Martha’s Vineyard, and Nantucket. Marine Extension Bulletin. pp. 4. 12. Sims, S.A., J.R. Seavey, and C.G. Curtin, 2013: Room to move? Threatened shorebird habitat in the path of sea level rise—dynamic beaches, multiple users, and mixed ownership: a case study from Rhode Island, USA. Journal of Coastal Conservation. 17, 339-350. DOI: 10.1007/s11852-013-0263-2. 13. Guilfoyle, M.P., R.A. Fischer, D.N. Pashley, and C.A. Lott (eds), 2007: Summary of Second Regional Workshop on Dredging, Beach Nourishment, and Birds on the North Atlantic Coast. U.S. Army Corps of Engineers, Dredging Operations and Environmental Research Program, 88 p.
14. Speybroeck, J., D. Bonte, W. Courtens, T. Gheskiere, P. Grootaert, J.P. Maelfait, M. Mathys, S. Provoost, K. Sabbe, E.W.M. Stienen, V.Van Lancker, M. Vincx, and S. Degraer, 2006: Beach nourishment: an ecologically sound coastal defense alternative? A review. Aquatic Conservation: Marine and Freshwater Ecosystems, 16, 419-435. 15. Rivas, M.L., P.S. Tomillo, J.Dieguez-Uribeondo, and A. Marco, 2016: Potential effects of dune scarps caused by beach erosion on the nesting behavior of leatherback turtles. Marine Ecology Progress Series, 551, 239-248.